Southern Baptist Seminary Confronts History Of Slaveholding And 'Deep Racism' In a 71-page report, Southern Baptist leaders are documenting their dark history, as if by telling the story in wrenching detail, they may finally be freed of its taint. 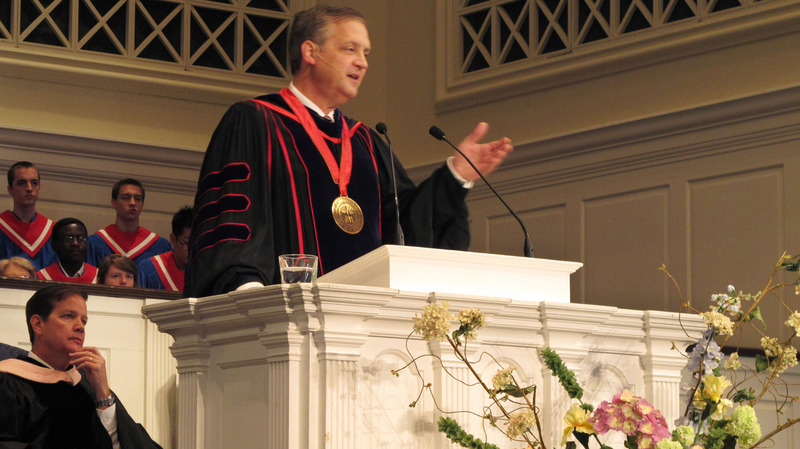 Southern Baptist Theological Seminary President R. Albert Mohler, Jr. speaks at the school's convocation ceremony in 2013. Mohler, who has led the seminary for 25 years, commissioned a report on the role racism and support for slavery played in its origin and growth. The Southern Baptist Theological Seminary, the denomination's flagship institution, this week released a 71-page report on the role that racism and support for slavery played in its origin and growth. "The founding fathers of this school — all four of them — were deeply involved in slavery and deeply complicit in the defense of slavery," writes school President R. Albert Mohler Jr., in a letter accompanying the report. "Many of their successors on this faculty, throughout the period of Reconstruction and well into the 20th century, advocated the inferiority of African-Americans and openly embraced the ideology of the Lost Cause of southern slavery." We knew, and we could not fail to know, that slavery and deep racism were in the story. "We have been guilty of a sinful absence of historical curiosity," Mohler, 59, wrote in the introductory letter. "We knew, and we could not fail to know, that slavery and deep racism were in the story. We comforted ourselves that we could know this, but since these events were so far behind us, we could move on without awkward and embarrassing investigations and conversations." "The seminary's early faculty and trustees defended the righteousness of slaveholding," the report says, "and opposed efforts to limit the institution." Some of them argued that slavery was in the best interests of the slaves themselves, while others insisted it was "a God-ordained institution." The seminary leaders opposed Abraham Lincoln's election and argued vigorously on the eve of the Civil War in favor of secession, seeing it "as the only hope for preserving slavery." "It's a very difficult story," Mohler told NPR. "But it needed to be told. It needed to be documented, and it needed to be done now." The Southern Baptist Convention formally apologized to African-Americans in 1995 for the denomination's pro-slavery past, and in 2017, the convention adopted a resolution condemning white supremacy. The seminary's report nevertheless breaks new ground. The "history" section of the current SBTS website does not disclose that its founders were slave owners and ardent defenders of the institution of slavery. "One of the first things that will happen is that our institutional history will be revised," Mohler said. What that might entail is not yet clear. There are no statues of the founders on the campus to remove, according to Mohler, although the seminary's undergraduate college is named after James P. Boyce, one of the four founders, and some buildings and student associations carry the names of other pro-slavery seminary leaders. "Taking the names off in a sense is just an effort to hide," Mohler said. "This is our story. This is exactly who we are. Our responsibility is to serve God faithfully, both in what we retain and in what we reject from those who came before us." Notwithstanding the seminary's new openness about its pro-slavery past, the detailed chronology ends in 1964. "In the decades following the civil rights movement, the seminary continued to struggle with the legacy of slavery and racism," the report concludes, but without further elaboration. "Making a statement about Confederate monuments might be a next step," says Alison Greene, a historian of U.S. religion at Emory University in Atlanta, "or taking a stand on questions of voting rights in the 21st century. That would be really significant." Greene, who was raised as a Southern Baptist, found the seminary report lacking in its failure to acknowledge any consequence of the denomination's recent association with conservative politicians and the policies they have promoted. "It papers over a generation of hand-in-glove cooperation with efforts to roll back every single social program that served African-Americans or promised to rectify, even in the smallest ways, the gross economic and social effects of enslavement and segregation and inequality on black communities," Greene says.